If you have an idea of a field that you would like to go into or are looking at graduate schools or post-graduate experiences, you should consider certain things. Be sure as an undergraduate that the educational experiences offered in areas that you might want to major in are good ones. Be sure that the school, if possible, is a good fit for you. I got financial aid to go to a small private religious college that had a good academic reputation. I was comfortable there because I had grown up in a rural area near a small town. Of course the college was bigger than my high school; but it was not so big as to feel unfriendly. As a christian school, it did not have a reputation as a party school and sororities while active did not isolate themselves in houses, but lived in the dorms with everybody else. While no degrees were offered besides a bachelors, it had a very active psychology department which offered practical experiences. Sometimes schools with graduate programs do not offer good experiences for undergraduates and the classes are often taught by graduate students. 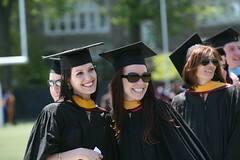 Choosing a graduate school is very important, not only do you want one that has a good reputation in the field you will be studying, but also it should offer studies that will be meaningful to you and that you will like participating in. In schools with a major professor system and/or offering research assistant positions to help you finance your education, you should investigate and see what kind of research is being done at that school and if you would be comfortable doing that type of research. People often do their masters thesis in an area of research that their major professor is involved in. It is not a good introduction to doing work in your field if you don’t like what you are doing or if you are not very talented at making new discoveries in that field of research.